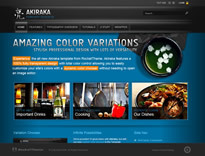 Only days after releasing the Akiraka theme at the begging of the month, RocketTheme have released a bonus theme for club members; Akiraka Essentials. This theme, on the face of things, looks almost identical to the original but it's like buying a car. You can have two cars side by side that look the same - it's about what is under the bonnet. This theme is much lighter and much faster than the original but still comes with all the extras. So, for the information on this theme click here or to see a demo visit RocketTheme.